Courtyard entry garage homeplans create instant curb-appeal, whether they are angled or straight. Common in Craftsman design house plans, courtyard designs add visual interest with a separate roof line and architectural details. Courtyard entry garages are often adorned with decorative trim work, dormers, or gables. Custom garage doors and stylish outdoor lighting further enhance the look. In addition to curb-appeal, a courtyard entry garage can be functional. An angling garage creates a smoother entry for a courtyard driveway. Choosing an angled or straight courtyard entry garage plan may be determined by your lots width or depth restrictions or may just be an aesthetic preference. Overall house dimensions are listed on our website for every home plan so you can ensure your dream home plan will fit your lot and with your particular setbacks. The Cedar Court 5004 is a luxury house plan with a three-car, courtyard entry garage. This hillside walkout basement home plan enjoys common and personal spaces on both floors. Each bedroom has a private bathroom and a walk-in closet. The Mahoney plan 1342 is a two-story design with a straight courtyard entry garage. At just over 50 feet wide, this design works well for a narrow lot. 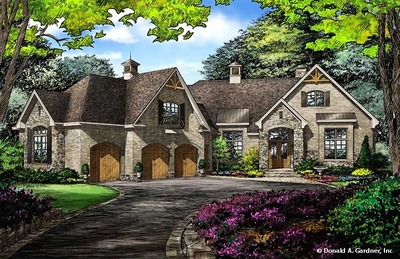 Whether you are looking for a courtyard entry garage plan because you enjoy the look or because it will fit well on your lot, Donald Gardner Architects has a wide variety of plans to choose from. Courtyard entry garage house plans are available in a variety of styles from Craftsman, Rustic, Mountain and more, are available in one story homes and hillside walkout designs, and a wide range of square footages from small to luxury. Find your dream home plan with a courtyard entry garage today!